Bangsar, 14 Oct: There is no stopping Umno former president Dr Mahathir Mohamad. Almost on a daily basis, he's U-turning against his old party, against the coalition he once led for 22 years, and against his old self. In this latest incident, he was full of praise for Azmin Ali, the Selangor MB and one of Anwar Ibrahim's most trusted. Mahathir has cited BR1M as one of the reasons he's so against PM Najib Razak, but here he is endorsing free water and BR1M-like handouts for newlyweds and firstborns. still better than jibby by miles ahead. 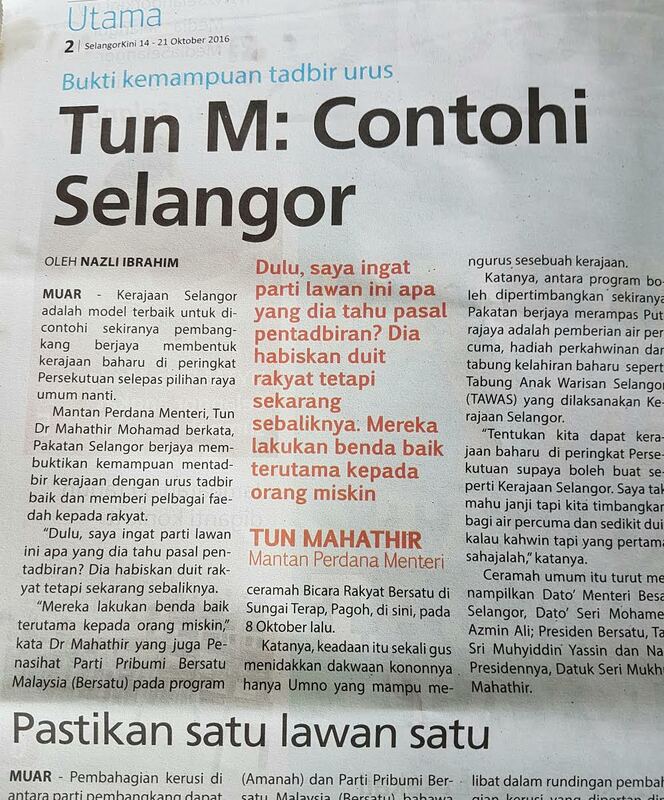 "There is no stopping Umno former president Dr Mahathir Mohamad. Almost on a daily basis, he's U-turning against his old party, against the coalition he once led for 22 years, and against his old self." Really as bad as the U-turning bloggers. Just put cash near their tails, and they'll chase it. The old ones may not summon enough energy for another U-turn, and anyway there's always that little retainer for The Mole. The one thing I'm very sure... what made Dr.M 'U-turned'... was 1MDB's debts & Jho Low... and that's a fact you seems shy to mention. Its a fact... that 1MDB-Jho Low's scandal... have united the opposition Parties, regardless of race, against UMNO-Najib. And... it's a fact too... that 1MDB-Jho Low's scandal... had prevented Haji Hadi from declaring open support for UMNO-Najib. Haji Hadi must have realized that his party would split again, this time worse still, if he had hastily made that call. Now... let wait till Oct. 22, when PAS HQ are convening a meeting to discuss their future political direction, notwithstanding article RUU 355 being put to vote in Parliament. Apa yang betul tetap betul. Rasuah tetap rasuah.